I’m baaaaack after a semi-relaxing weekend and a busy start to the week. You know how it goes. But I’ve got a major countdown going on until Thanksgiving break…only 23 days until no school for a week and a couple days! Yeah, that’s 23 days total, including weekends. Where has the semester gone? There’s only 5 1/2 weeks left, not counting finals week. Not that I’m complaining though. I’m in desperate need of a break! This week’s edition of everyone’s favorite party features what I ate on Monday, along with a few extra pics from the weekend. I’ve been taking more fashion photos lately so enjoy those! Can I pull off the hippie look? Sometimes I think I could almost be a hippie. Vegan? Check. Liberal leaning? Yup. Long hair? Of course. Love of boho fashion? Sure. I don’t do the whole drug thing or ‘natural’ hygiene habits (I like my showers and trips to the salon, thankyouverymuch) but I think I could fit in with the hippie crowd just fine. 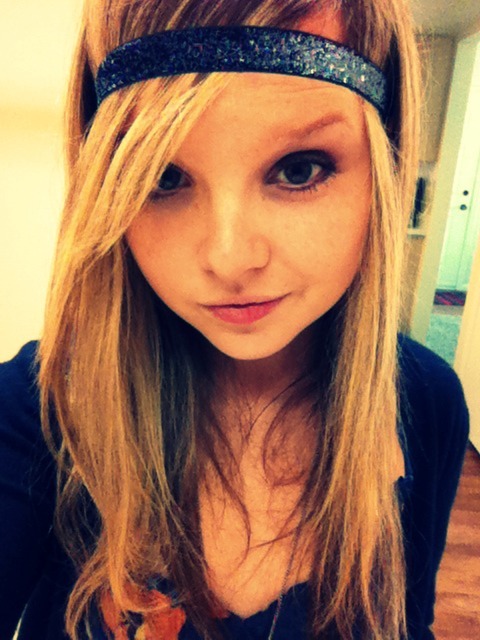 Plus I have a newfound love for their headbands. I just think they add a cute touch to almost any outfit. But are sparkles considered hippie? 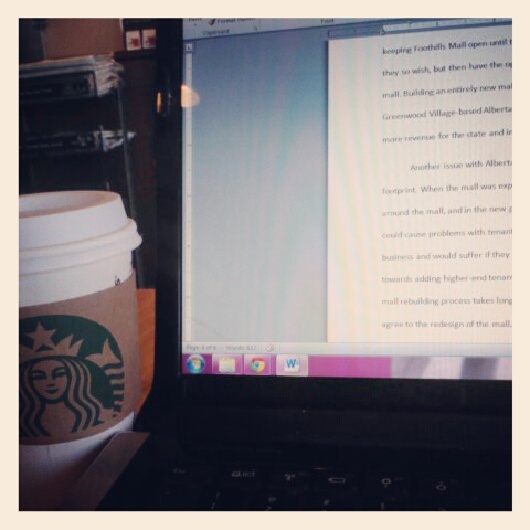 I spent a few hours on Sunday at my favorite FoCo Starbucks. Not because I love coffee so much (though I do) but because I had a paper to write and I thought I’d be less distracted at ‘bucks. Well, turns out that a change of scenery did me good. I was able to finish the paper, enjoy a tall Americano with sugar-free hazelnut and do some people watching while jamming out to Pandora. It was a great, productive afternoon. First socca pizza = success flavor-wise, but not so pretty. I finally invested in some garbanzo flour (it was only $2.50 at Sprouts…score!) so I could try out the blogger fave, socca. 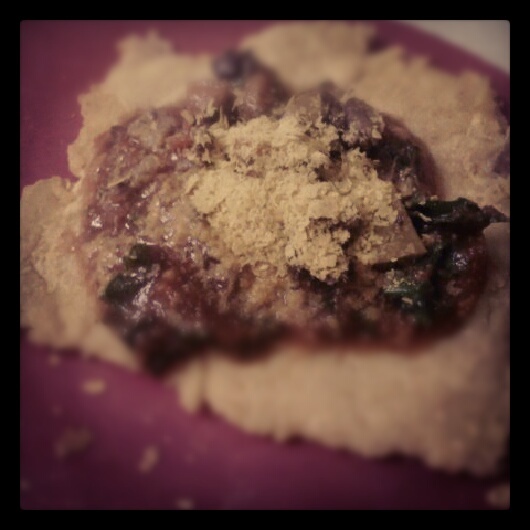 And I’ve gotta say, it makes a great gluten-free grain-free sub for pizza crust. However, I’m warning you–don’t taste test the socca batter before you cook it. The flavor reminded me of when I used to get bloody noses, it was so metallic-y. But once cooked (I did the skillet method) it tastes great. Especially if you mix it with plenty of spices. 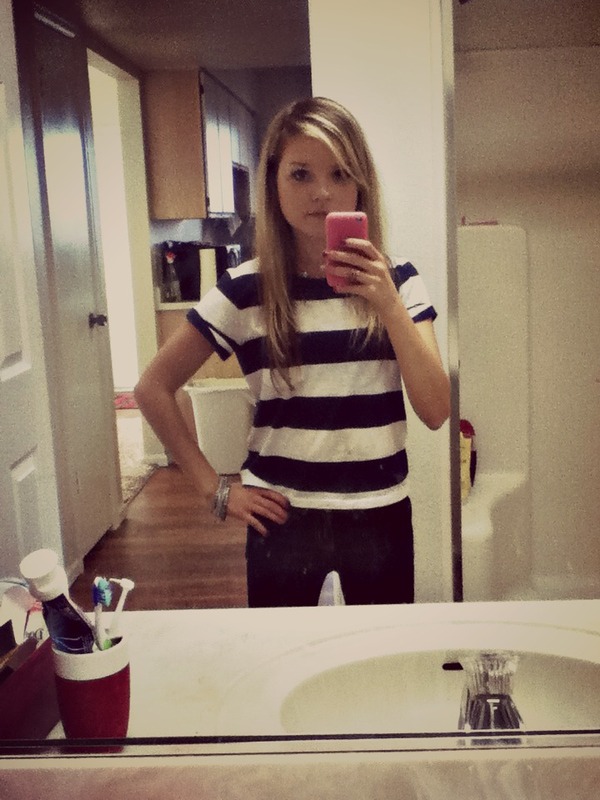 Saturday’s errands outfit: navy striped crop tee (Hollister), dark wash jeggings (American Eagle), silver bangles (American Eagle). Monday breakfast: pumpkin vanilla protein pudding. Topped with pomegranate seeds and maple pecans. Like I said, it’s been warm enough here even in the mornings to not want warm breakfasts quite yet. I still have to do smoothies and protein puddings so I don’t overheat. But I still want my meals to be fall-inspired, so Monday’s breakfast fulfilled both requirements. 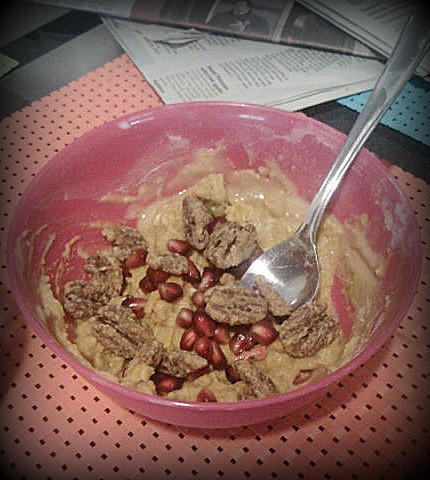 Pomegranate tastes awesome with pumpkin and pecans and maple. It’s like all the flavors of fall in one bowl. Lunch plates for the indecisive girl. 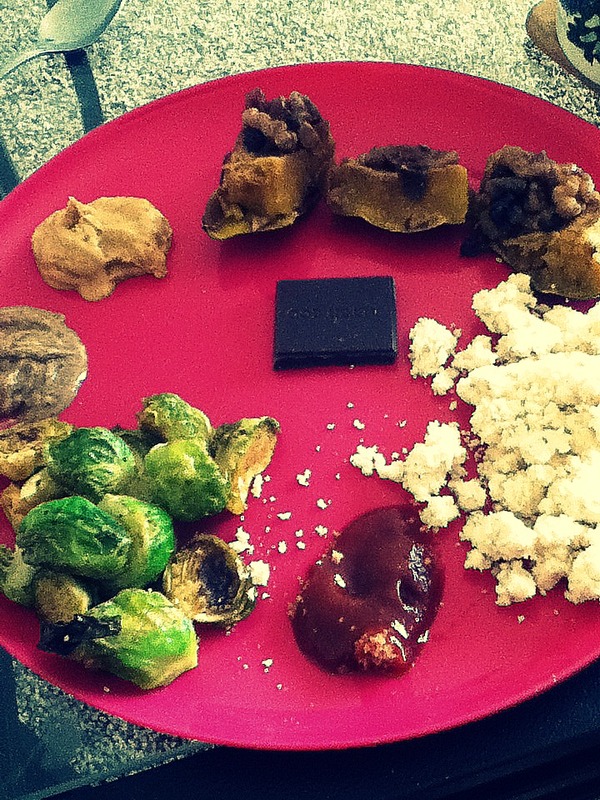 Coconut oil roasted brussels sprouts (with organic ketchup), coconut flour microwave muffin crumbles, sweet stuffed acorn squash, peanut flour paste, almond butter, Alter Eco mint chocolate bar. I haven’t been doing snackplates as much lately but I have been doing them for lunches! One of my go-tos is a coconut flour microwave muffin. 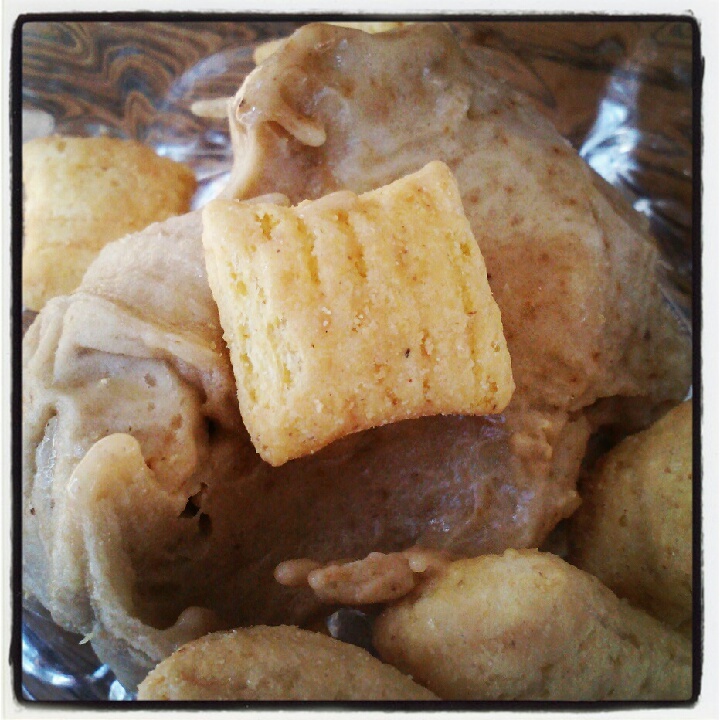 It’s so simple to make, just add some coconut flour (1 or 2 tbsp), baking powder, salt/stevia and almond milk to a microwave safe bowl and let it cook for a minute or so. 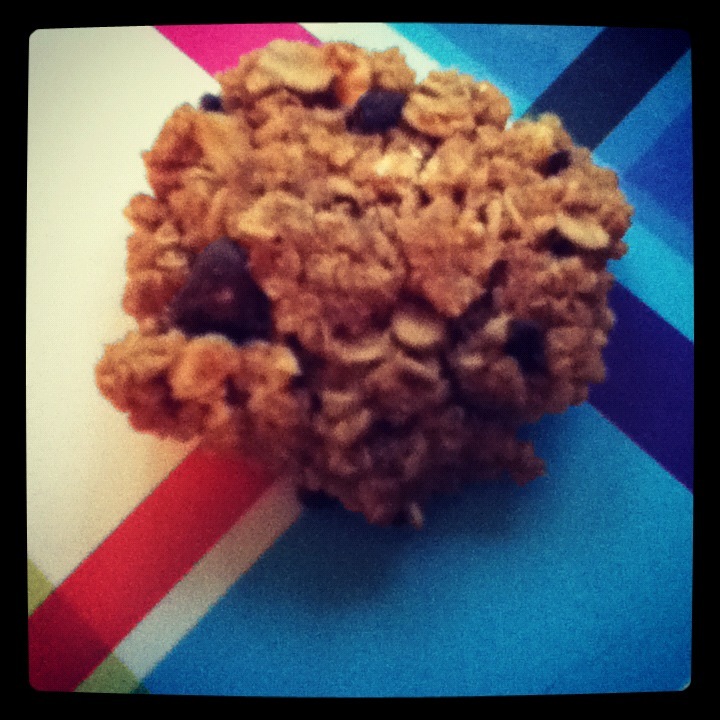 It turns out really crumbly, but totally voluminous and cake like. 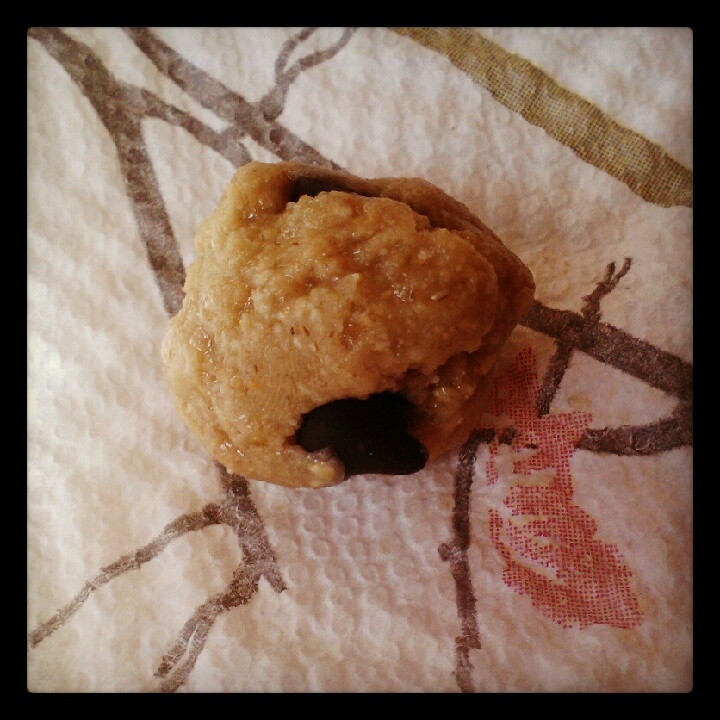 It’s crazy that a grain free flour turns out like a tasty muffin, but it just does. And I love it! 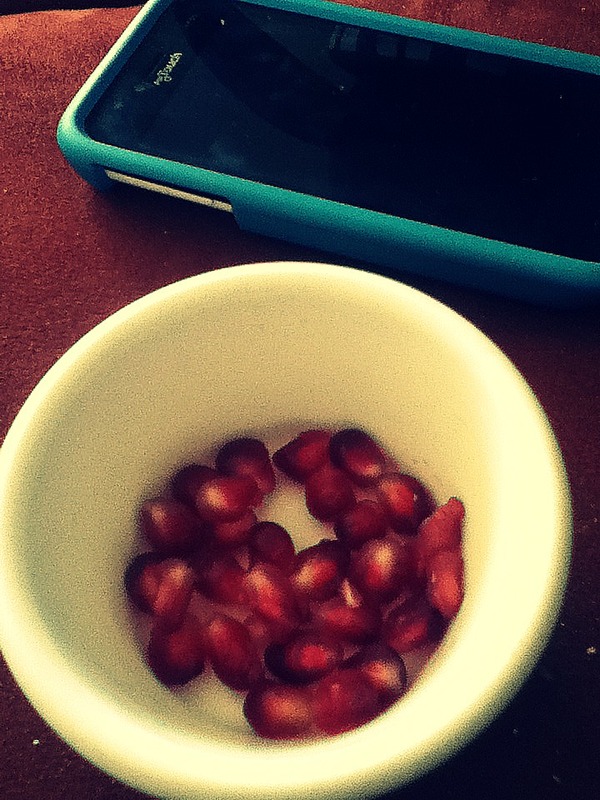 A side of pomegranate seeds and my phone. 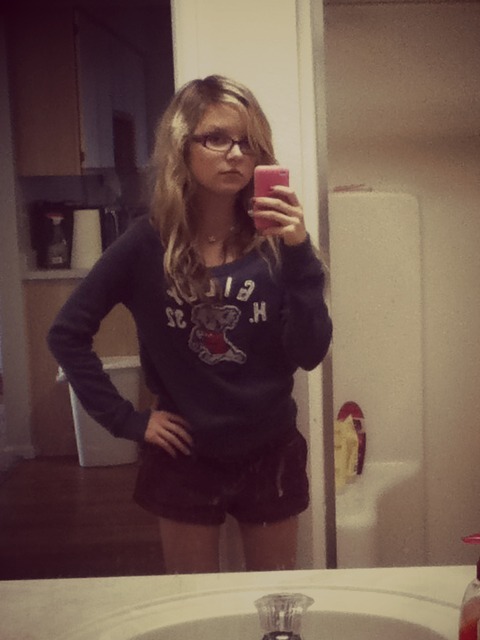 Monday’s outfit: navy pullover sweatshirt (Gilly Hicks), brown woven leather belt (Abercrombie), burgundy twill shorts (Abercrombie). 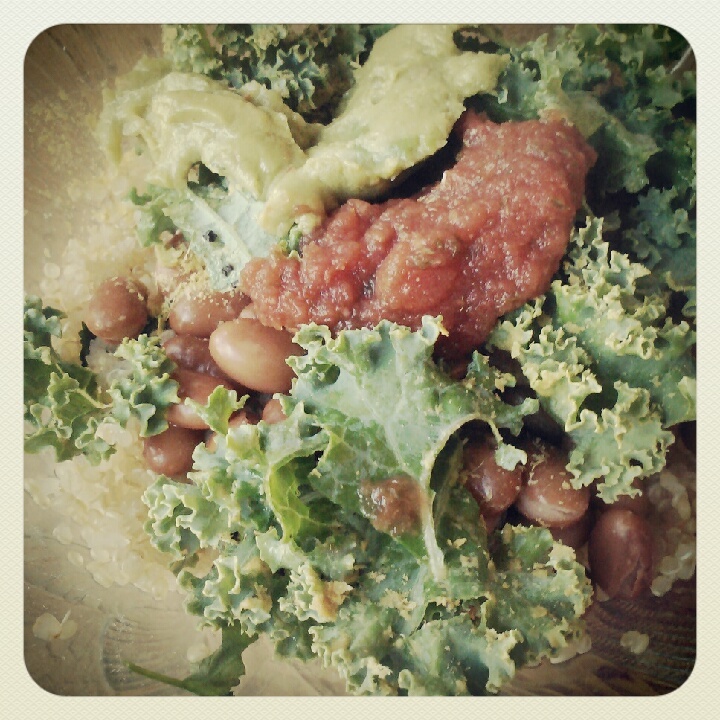 Yes, I like weirdly green food. 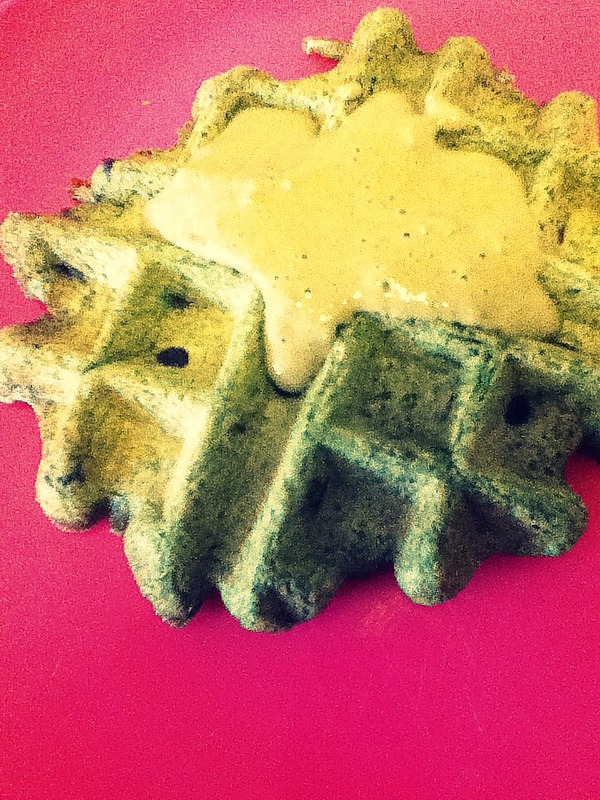 Mint chocolate buckwheat waffle made with kale, topped with mint kale infused protein frosting. I love love love homemade waffles, in case you couldn’t already tell. My waffle maker is my most-loved kitchen appliance for sure, it gets used almost every day whether for breakfast or a snack. I prefer making my own because ones from the store don’t taste that great, they aren’t as healthy and with homemade ones I can add in only the ingredients that I want and make them whatever crazy flavors I’d like! Plus they’re almost as convenient as store bought, so why not? 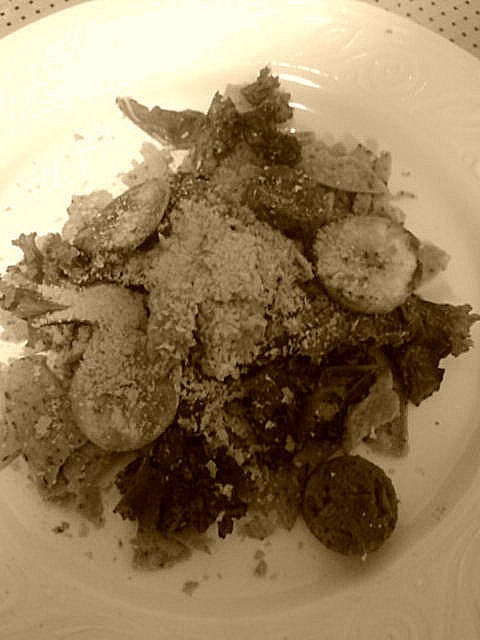 Sepia-ified nachos. Sweet potato multigrain chips topped with 1/4 vegan Mexican chipotle seitan sausage, coconut oil-sauteed plantain slices, guacamole, crispy kale and nooch. 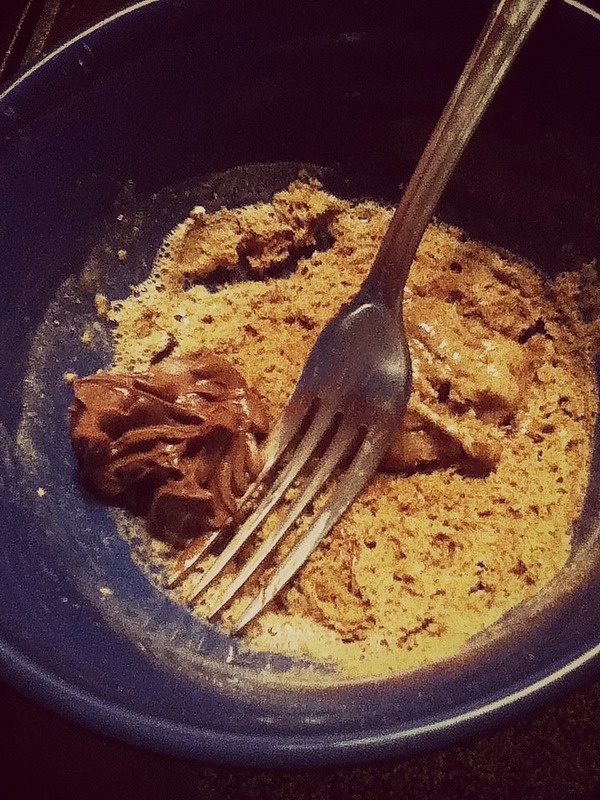 My latest favorite nighttime snack: chocolate peanut butter protein microwave cake, made with raw chocolate protein powder, peanut flour, almond milk, baking soda and topped with almond butter and vegan mousse. I have a strange addiction to microwave protein cakes lately. 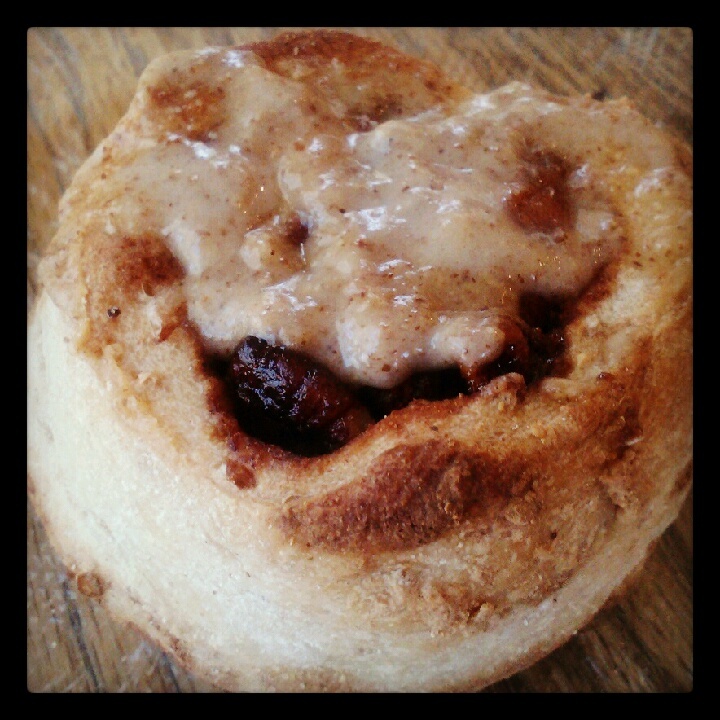 They’re just so foolproof and you can make them almost any flavor. And they just call for toppings, dontcha think?! I recommend coconut milk ice cream, coconut whipped cream or almond butter! Do you prefer making some things from scratch, or buying them? Have you ever tried socca or pomegranate?